DUI (driving under the influence) is a criminal charge that could happen to almost anyone. Police are extremely aggressive about arresting anyone who might even possibly be drunk. With the police this aggressive and eager to arrest, it’s easy to imagine and understand how it could happen to you. A couple of drinks at dinner, a burnt tail light, and bad knees or feet so you can’t do field sobriety tests. Add those up, and you will find yourself in handcuffs and facing criminal drunk driving charges. We understand what you are going through. The standard of probable cause for arrest is minuscule, and the criminal just system in Arizona, from the police to the judges & prosecutors, as well as public opinion, are all stacked against you. photo credit: minimoniotakuWhen you are up against all that, you need the best DUI defense lawyer you can find. Please call us and take advantage of our free DUI defense consultation. We’ll help you make sense of what’s happened to you, lay out your legal options and let you know how to best protect your freedom, your right to drive, and your livelihood. Under the law, if you are found in control of a vehicle and your blood alcohol level is .08 or greater, you may be found guilty of Driving Under the Influence (DUI). You can also be charged with DUI if you are impaired and under the influence of any amount of alcohol or impairing drugs, including legal prescription drugs or over the counter medications. 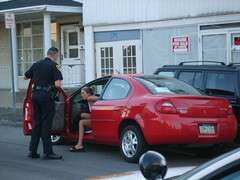 Driving under the influence is a Class 1 misdemeanor for a first offense. Jail time: Minimum of 10 days in jail. Maximum jail sentence: up to 6 months. Minimum of $250 in fines and up to $2,500 in total fines and fees. License suspension and required ignition interlock device on your car. (See our ignition interlock page). The real deal: Nine days of your 10 day jail sentence may be suspended in many cases if you complete a drug/alcohol assessment and possibly attend an alcohol education class. With the stakes this high, it is important to find the best Arizona DUI defense lawyer you can. Please contact us to find out if we are the right attorneys to help you through this difficult experience. An Extreme DUI charge in Arizona is defined as a DUI in which your blood alcohol level is .15 or higher. Extreme DUI / Driving under the influence is a Class 1 misdemeanor for a first offense. Jail time: minimum of 30 days in jail. If your blood alcohol level is above a .2 you could be looking at a mandatory minimum of 45 days in jail for a “Super Extreme DUI”. Maximum jail sentence: up to 6 months. License suspension and required ignition interlock device on your car for 1 year. (See our ignition interlock page). The real deal: depending on your blood alcohol level you could be looking at a mandatory minimum of 30 days in jail (if your blood alcohol level is between .15 and .199 aka Extreme DUI) or 45 days in jail (if your blood alcohol level is above .2) for “Super Extreme DUI”. Call us to find out how we can help with this. This is true for impairment for any alleged substances. Until just recently, it was legal to be convicted of marijuana DUI without them even proving you were impaired or high at the time of driving. So you can’t expect a system like this to treat you fairly or cut you a break without a strong defense lawyer on your side. These issues are complicated, and the penalties serious. But we are happy to talk to your about the best options to beat the case, or avoid the most serious possible consequences associated with a conviction. What if I Refuse to Take the Breathalyzer Test or Submit to a Blood Test? With all of the potential repercussions of a DUI conviction, it is vital that you find the right attorney. With the skills and experience our attorneys can offer, you will know that you are in good hands when you contact us. Leave the legal details to an attorney you can trust and call us for a consultation today. Find out for yourself, with no risk, if we are the attorneys for you.